We all love deadlifts, and we all hate them. They are effective, are crazy hard, feel great, and feel horrible. It’s a mix of life. Mitigating the particularly annoying part of the lift by having an easy way to load plates on the floor is a good thing. This is the most obvious, most troublesome and what you have to do before you figure out something better. You stick a plate into position at the end of the sleeve as best you can, then lift the bar with one hand while sliding the plate on with the other hand. An intermediate lifter can do this for two 45lb plates on each side (225lb). The third plate isn’t as fun. A word of caution: You can injure your back doing this. To stay safe, heed Rip’s advice in this video regarding foot placement and spinal rotation. You have to keep the small plate under ONLY the first 45lb plate, and that doesn’t give it much room before it wants to roll off. It sounds good until you try it and find out it doesn’t work that great. Maybe you’re lucky enough to have the right shaped plate. You brush your teeth, wear deoderant, and shower daily, right? Being the considerate person you are, you also have a gym towel. I’m certain of that. Even in your personal home gym, you have one handy, because you’re not a slob. Fold it up and stick it under the first plate. All you really need is a few millimeters. This works well for one plate. For two or more plates you will need to get it just right to keep the bar in place, keep the towel under only the first plate as it squishes, and raise the bar up enough. Jacking the bar up by the shaft makes sense. Leverage is an amazing thing. All that weight just goes away. This jack gives you the same feeling as ringing a bell to have the waiter bring you a snack as you’re lounging on your beach chair in the sand with some important drink in your hand. It’s that easy. Normally the only kind of jack most of us ever have opportunity to use is a tire jack as we’re stranded on the roadside, or, hopefully, practicing it in our garage before that ever happens. A car jack you’ll get from the auto parts store isn’t the right shape on top to keep the bar from rolling off, and it doesn’t protect the bar’s finish. It’s a heavy piece of equipment that’s kind of silly just to lift up a barbell a tad bit. You should feel ridiculous using it. Rogue’s jack, on the other hand, is built entirely for this purpose. You stick the UMHW protected cup on the bar, kick the long end down, and it rocks into place, holding the plates an inch above the floor. Bend over and lift that end to drop it. Very doable even with heavy weights and after you’re recovering from a heavy set. For the size, it doesn’t get any easier. You can order it from Rogue Fitness. I came across this beauty on Amazon. Dirt cheap, and effective! It’s just a piece of well-shaped high density rubber. Small enough to throw in your gym bag, and an easy color to spot on black rubber flooring. 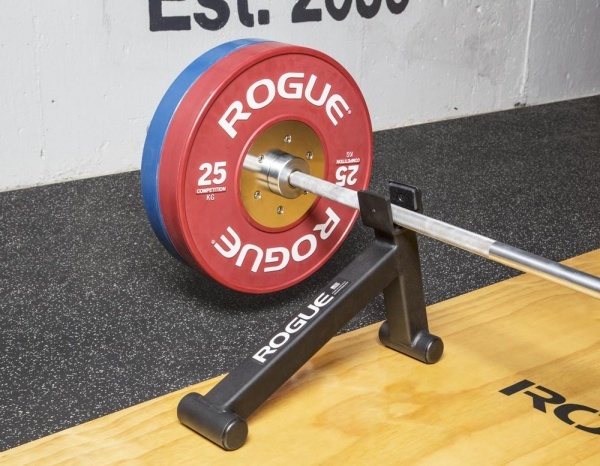 This makes the Rogue mini deadlift jack look a little over-the-top. With this you just roll the first plate onto the wedge and it stays right there in the saddle. The downside with this wedge is you’re on your own to get the first plate on each side. It only helps you load subsequent plates. For weaker lifters who are struggling to deadlift 150 lbs, loading the first 45lb plates from the floor is awkward. Rogue’s jack will be your best friend. This wedge is what I use. It’s my favorite solution. Even if I had Rogue’s mini jack, I’m not sure I’d prefer it. I’m strong enough that sliding the first plate on isn’t an issue. And you can just toss the wedge across the room when you’re done. I prefer equipment I can toss. But it’s a close call. 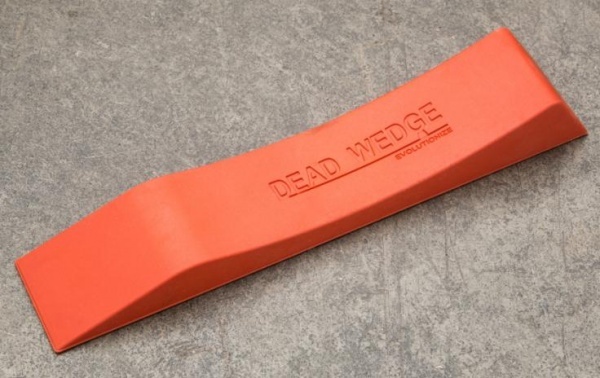 You can get the Dead Wedge from Rogue Fitness or Amazon.